Wayne Thiebaud was born Mesa, Arizona in 1920, and his family soon moved to Los Angeles in 1921. In high school he became interested in stage design and lighting, and worked part-time at a movie theater where he made posters for lobby displays, 1935-1938. During this time he also worked as a summer apprentice program in the animation department of Walt Disney Studios, 1936. From 1942 to 1945, Thiebaud served in the Air Force, assigned to the Special Services Department as an artist and cartoonist, and eventually transferred to the First Air Force Motion Picture Unit, commanded by Ronald Reagan. 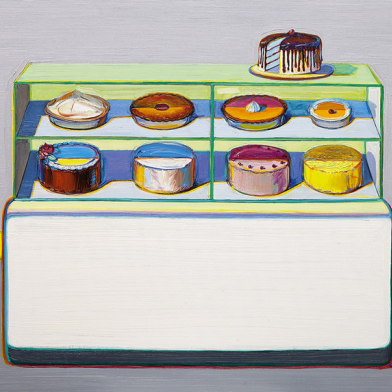 It is not difficult to detect the influence that this commercial experience had on his later paintings attributed to Pop Art; Thiebaud's characteristic work displays consumer objects such as pies and cakes as they are seen in drug store windows. Thiebaud uses heavy pigment and exaggerated colors to depict his subjects, and the well-defined shadows characteristic of advertisements are almost always included. Objects are simplified into basic units but appear varied using seemingly minimal means. From 1949 to 1950, Thiebaud studied at the San Jose State University and from 1950 to 1953 at the California State University in Sacramento. He had his first solo exhibition at the Crocker Art Gallery in Sacramento, and between the years of 1954 and 1957, he produced eleven educational films for which he was awarded the Scholastic Art Prize in 1961. 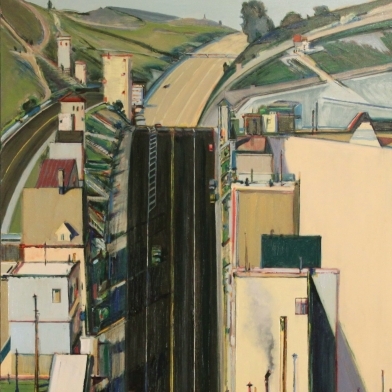 Thiebaud lectured at the Art Department of the Sacramento City College until 1959, when he became a professor at the University of California in Davis. Today, Wayne Thiebaud lives and works in California.